FACCNE is proud to be a partner of Boston’s premier international event of the year! We hope you can join us for this highly successful forum on February 26, 2019 that attracts a host of New England companies involved in international business, and notable speakers and panelists. 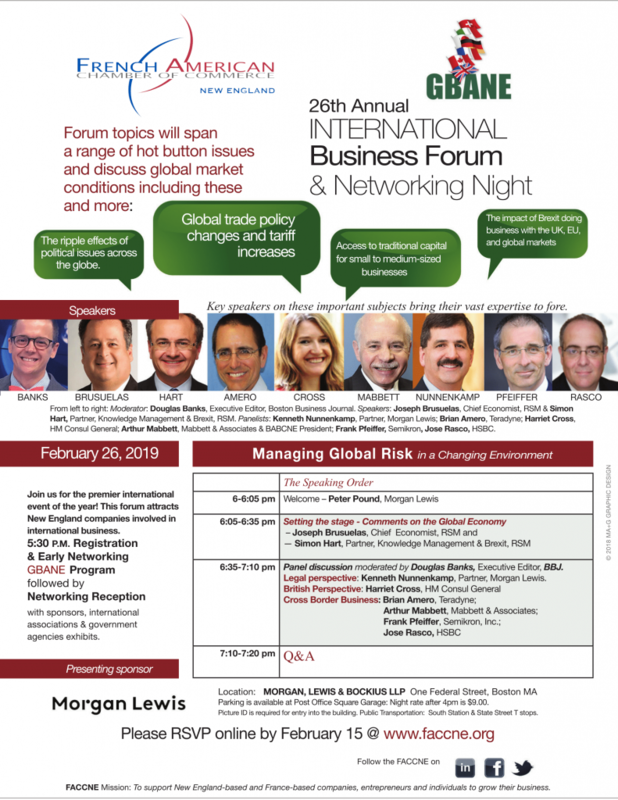 Presented by the Global Business Alliance of New England (GBANE), of whom FACCNE is a member, this year’s theme of the 26th Annual International Business Forum & Networking Night is Managing Risk in a Global Environment. Panelists: Kenneth Nunnenkamp, Partner, Morgan Lewis. Harriet Cross, HM Consul General, + two global companies that are being affected by tariffs, policy changes, etc. Moderator: Douglas Banks, Executive Editor, BBJ . Forum to be followed by a networking reception with sponsor and association exhibits.